-- Please Select --1 ½"2"5/16"11/16"
The Jerusalem Cross was the symbol of the Crusader Kingdom of Jerusalem, which existed for almost two hundred years after the First Crusade. The four smaller crosses are said to symbolize either the four books of the Gospel or the four directions in which the Word of Christ spread from Jerusalem. Alternately, all five crosses can symbolize the five wounds of Christ during the Passion. 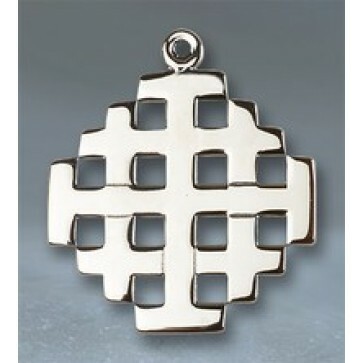 Sterling Silver Jerusalem Cross is available in 4 sizes.